How About A Fake License For Your Fake Service Dog? More info on the hotly debated topic of service dogs being allowed in stores–apparently there are companies who are “certifying” animals as service dogs for a fee and giving people a “license” for a fee. It’s amazing but people are paying anywhere from $35 to $200 and in some cases it’s a repeating yearly fee when in fact no license is even needed! So again this law is leading to abuse and there are people using it to profit by sending people a meaningless piece of paper for a fee. So for the most part, it sounds like if someone gives you a license like that the dog is probably NOT a service animal. A real animal’s owner would know it’s not required. Another thing to note is that a dog that provides “emotional support” for their owner alone is NOT a service animal. It must be trained to do a specific task. And if they are behaving inappropriately the owner can be asked to take them out. Obviously taking a dump in the store would qualify as inappropriate so feel free to ask those dogs be taken out as well. You can read the actual laws about service animals here. Certification does not mean an individual dog is a service dog. Neither does registration or an official looking ID. There are several businesses selling fake certification, registration and IDs over the internet. All a person need do to get these products is pay a fee. Their dog is never tested and their disability is never verified. All the product really means is that the person was willing to pay money to get it. 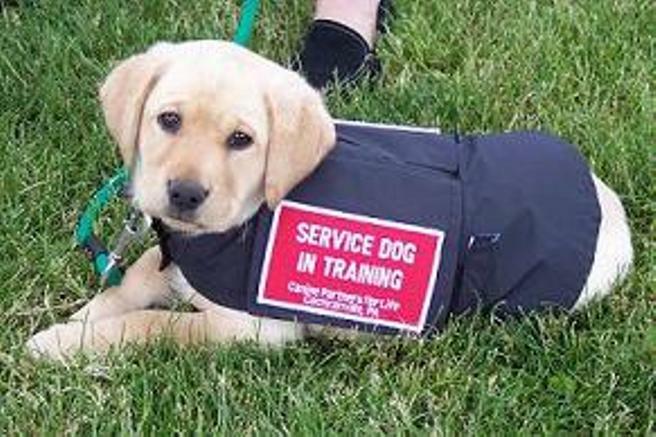 If you question whether ID or certification is legitimate, a quick internet search of the name of the organization will reveal whether it is an agency that actually trains service dogs, or one that merely certifies, registers, or identifies any dog sight-unseen for a fee. Remember that “[a]nimals whose sole function is to provide emotional support, comfort, therapy, companionship, therapeutic benefits, or to promote emotional well-being are not service animals…” so a service animal must be specifically trained to DO something. BE WARNED: when you see a fake certification, it is a STRONG indication that the dog is not a legitimate service dog. People with legitimate service dogs tend to be familiar with laws and know that certification is not required so long as the dog meets the legal definition. Those who purchase fake certification do so because they, or those they encounter, doubt their dog’s real status and it is easier to purchase a fake document than to actually get their dog properly trained and evaluated by an expert. Note: Not a single service listed above tests the dogs they certify, register, or ID. They do nothing to verify the dog’s training or the owner’s disability. All that is required is that the purchaser fill out a form with the information for the certificate and where to mail it, and include payment ranging from $35 to over $200 depending on the package being purchased. Ask yourself why the regulation requires a current doctor’s letter. It’s not to prove you’ve paid your annual fee for a meaningless ID card, but as evidence your treating physician still feels you qualify as disabled and require either an ESA or PSD. Since they don’t require any sort of documentation to purchase their ID kits (ranging up to $200), their card wouldn’t meet the requirement of a current doctor’s letter for those that must have documentation. Other than this specific case (a doctor’s letter for an ESA or PSD), documentation is only required if the person’s story is not credible. I personally fly all the time with my service dog, without issue and without showing ID, but he is a real service dog, and it does show in his behavior and demeanor. ** We had a run in with this one too. Our forum has a no advertisement policy. When the owner of this business was banned for advertising, he joined again under a false name, pretending to be someone looking for a place to get ID for his service dog. When we told him these places were scams, he suddenly started promoting his own business, pretending he had done a search and just discovered his own site! IP addresses matched, so we know it was the same person. Business owners, take heed: this problem is becoming rampant as more and more people enter the market of selling certification, registration, and IDs (including laminated cards, collars, leashes, and vests) for service dogs to anyone, for a fee, and without any oversight. The lure of selling something that costs less than a buck to make (such as a certificate or ID card) for $40 and more, is just too tempting to pass by. Fake “Service Dogs”, Please Keep Out of My Store.